Every year, more than one thousand patients have been diagnosed with different kinds of blood cancer. Many of them are very young or are family breadwinners. One can imagine how big an impact blood cancer have on their lives. 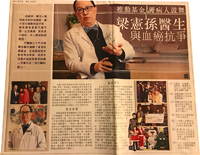 With the current medical technology, the recovery rate of blood cancer is over 50%, that is why the Hong Kong Blood Cancer Fund is set up - to offer them further support in their fight against cancer.